Congratulations to Pat Myers, our District Governor Nominee for 2020-21. 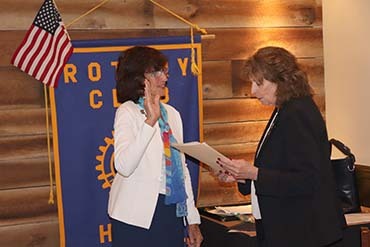 District Governor Beverly Ghent-Skrzynski visited the Hudson Clocktower Rotary Club on Wednesday, August 29, to induct our own Pat Myers as the District Governor Nominee for 2020-21. Beverly was introduced by HCR Club co-president Kathy Cybulski who also introduced Bev's husband David. David also served as District Governor in 1998-99. A native of Glen Ellyn, Illinois, Beverly gave an inspiring talk about what she called "Rotary moments" that took place throughout her history with Rotary, dating back to the 1980s. At one particular event, for example, she sat just a few feet from the featured speaker, Mother Theresa. She talked about the energy on display in our meeting and how much she enjoyed seeing our enthusiasm. When Beverly came from Chicago to Northeast Ohio, she joined the Rotary Club of Berea and became vice-president in 1996. She later served as President of the Rotary Club of Cleveland and was one of the lead organizers for the club when they produced the Cleveland Tall Ships Festivals in 2010 and 2013. Beverly's visit was highlighted by her swearing-in of Pat Myers as the District Governor Nominee for 2020-21. Pat was one of the founding members of the Hudson Clocktower Rotary Club in 2002 and has served the club, district and foundation in a number of capacities, including club president. We all know Pat as a tireless volunteer, a forward-thinking optimist, and a generous, encouraging and supportive member of our club. We wish Pat every success in her work with Rotary, now and for years to come! 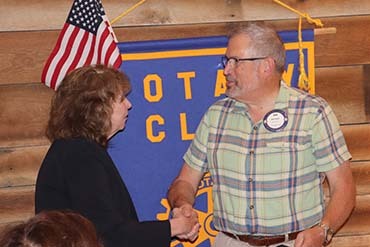 HCR Club co-president Kathy Cybulski also announced that Rotarian Bob Carter was being singled out for the Unsung Hero Award for his work with Leadership Hudson and Junior Leadership Hudson. Bob was a charter member of our club and was third President of the club in 2004-2005, following Jim Knauf. He was also serving the community as Fire Chief of Hudson at that time. When our club formed Leadership Hudson to train the next generation of community leaders, Bob and Jim led the classes each year for 10 years. Following Jim's retirement, Bob stayed on and recruited a class graduate, Jill Centrello, to be co-Leader. When the Hudson Community Foundation could no longer be Leadership Hudson's fiscal agent, Bob formed a committee that resulted in establishing Leadership Hudson as a 501(c)(3) organization. This gave Leadership Hudson the financial security it needed to continue to grow and thrive. "Through Bob's leadership, a whole community has been made better," said Cybulski. "Bob and all of you who are charter members of our club have made an indelible mark and are leaving a lasting legacy of community service, spirit and pride." Kathy went on to talk about getting to know Bob better during the time she has been a Rotarian. "It has been my pleasure to get to know Bob as a hard-working, conscientious, open-minded leader and a truly good and kind man who always places 'service above self,'" she said. "Bob is a Rotarian to be honored." Congratulations to both Pat Myers and Bob Carter! We are proud to have you as members of the Hudson Clocktower Rotary.